The Denver School of the Arts Bands encompasses the Concert Band, Wind Ensemble, The Jazz Workshop Orchestra, Chamber Ensembles, Percussion Ensemble and Jazz Combos. The DSA Concert Band, Jazz Workshop Orchestra and Wind Ensemble travels to LA and San Diego, California and performs at University of Southern California, Catalina’s Jazz Club, the San Diego School for the Arts and on the deck of the Midway Aircraft Carrier. The DSA Concert Band received a Superior With Distinction Award from the 2011 Colorado Bandmasters Association Middle School Band Festival. The Wind Ensemble performed at the Colorado Band Masters State Concert Band Festival receiving an Excellent rating. The DSA Jazz Workshop Combo performed at the Smooth Jazz Festival at the Colorado Springs Broadmoor Hotel upon invitation from Earl Klugh. The DSA Wind Ensemble performed at the Colorado School for the Deaf and the Scottish Rites Temple in a tour of southern Colorado and Santa Fe, New Mexico. 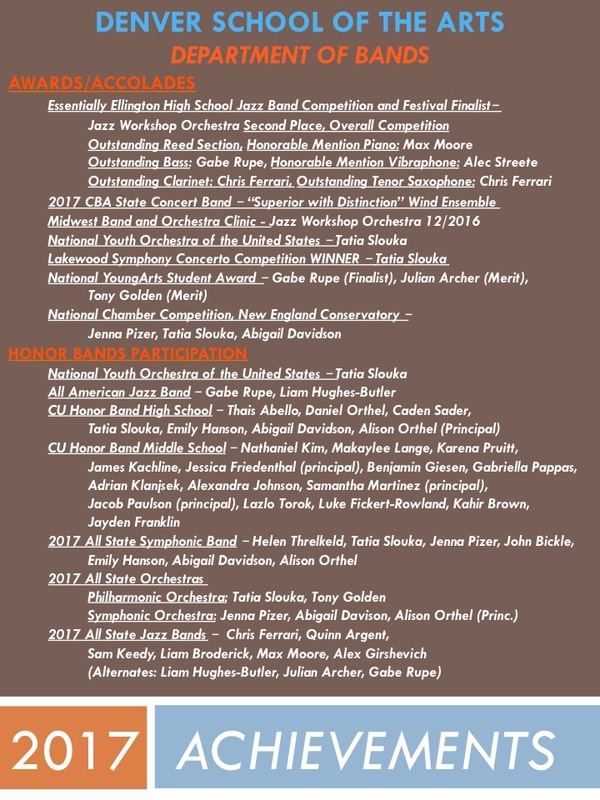 The DSA Wind Ensemble was selected to perform at the 2011 Colorado Music Educators Association Conference. The DSA Wind Ensemble performed at the historic Paramount Theater in Downtown Denver as part of the American Guild of Organists Guest Series. The DSA Bands combined with the DSA Orchestra to back the rock group Firefall at the Wells Fargo Theater in downtown Denver. The show’ “Walk More Softly” premiered the national kick off of the program of the same name and song written by Firefall member Jock Bartley. The DSA Jazz Workshop performs with alto saxophonist Greg Abate at the DSA Jazz Symposium 2010. The DSA Concert Band was selected to perform at the 2010 Colorado Music Educators Conference. Sam Crowe performed in the 2009 Grammy Student Jazz Band and was also selected to participate in the Brubeck Institute. The DSA Bands toured to New Orleans, LA in April 2009, on a performance/service trip. The students planted trees in New Orleans, performed at Loyola University, All Souls Episcopal Parrish in the Ninth Ward and at the Feret Street Festival. The DSA Jazz Workshop performs with the contemporary group Kneebody at the DSA Jazz Symposium 2009. DSA bands student composer Amy Darling received the Downbeat Magazine Student Music Award for Best Extended Composition in May 2008. DSA Woodwind Quintet received Downbeat Magazine Student Music Award for Best Classical Ensemble in May, 2008. DSA bands graduate Justin Doute performed at the 2008 Aspen Music Festival winning the soloist competition. Two DSA Woodwind Quintets were selected to perform at the 2007-08 Colorado Music Educators Conference in Colorado Springs in January 2008. The Wind Ensemble performed at the Colorado Band Masters State Concert Band Festival in April, 2008 receiving an Excellent rating. The DSA Jazz Workshop performs with alto saxophonist Greg Abate at the DSA Jazz Symposium 2008. Groups from the Denver School of the Arts Bands Department performed at over 60 events in the 2006-07 school year and the Jazz at Lincoln Center submission of the Jazz Workshop Orchestra was ranked in the top 20 in the nation, resulting in Mr. Hammond being given a full scholarship, airfare and accommodations to attend the Essentially Ellington Band Directors Workshop in New York City. The DSA Jazz Workshop performs with composer/arranger Chie Imaizumi and vibraphonist Victor Mendoza at the DSA Jazz Symposium 2007. In 2006, the international jazz publication Downbeat Magazine named DSA Jazz Workshop Orchestra vocalist Josiah Johnson as Best Jazz Vocal Performer. In 2006 percussionist Justin Doute was selected to perform in the National Wind Ensemble in New York, NY, drummer Adam Gertner was selected to attend the Brubeck Institute Summer Jazz Colony and the New York City Institute for Improvisation Workshop. The DSA Jazz Workshop performs with composer Jovino Santos Neto with Chuck Deardorf (bass) and Mark Ivester (drums) at the DSA Jazz Symposium 2006. The DSA Jazz Workshop performs with New York based group the Dave Phillips group at the DSA Jazz Symposium 2005. Downbeat Magazine recognized DSA bands in its June 2005, Student Music Awards issue receiving Best Big Band, Best Jazz Studio Orchestra and Best Classical Symphonic Band. Additionally, five DSA instrumental music majors were recognized as Best Soloists in the Outstanding High School Performance category for Jazz Instrumental Soloist Awards. In 2004 DSA band students performed on the Millennium Stage at the Kennedy Center in Washington, DC. 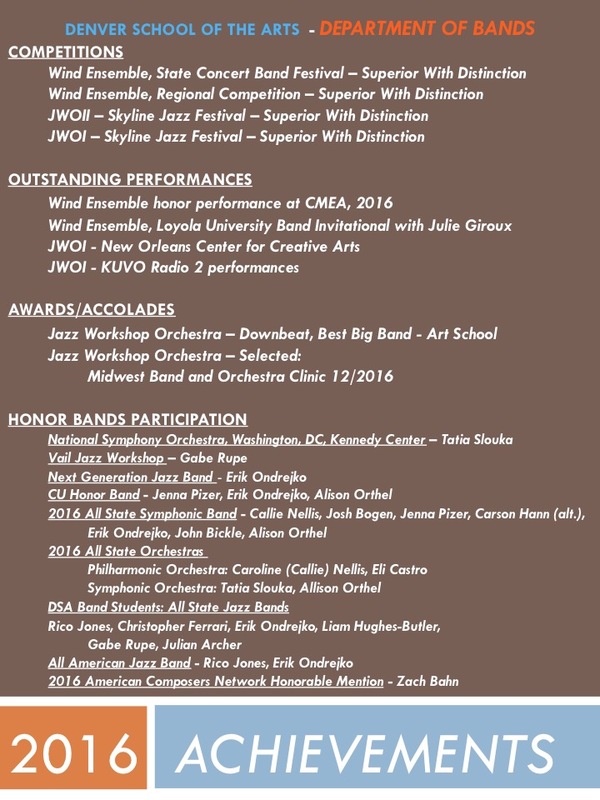 The Denver School of the Arts Jazz Workshop Orchestra was one of 15 bands nationwide selected to compete at Wynton Marsalis’ Essentially Ellington festival in New York in both 2004 and 1999 and was selected to perform at the Essentially Ellington Band Director Workshop in 2000. Denver School of the Arts Concert Band, Wind Ensemble, Jazz Workshop Orchestra and Chamber groups have been chosen to perform at the Colorado Music Educators Association Conference in Colorado Springs for seven of the last eight years and have been selected to perform at the Colorado Bandmasters Association State Concert Band Festival eight out of the last nine years. Denver School of the Arts band students are active participants in: Denver Young Artists Orchestra and Denver Chamber Players, All State Symphonic Band, All State Orchestra, All State Jazz Band, CU Honor Band, CSU Honor Band, Western State Honor Band, CCJA, Citywide CEC Combo and the Colorado Honor Band.